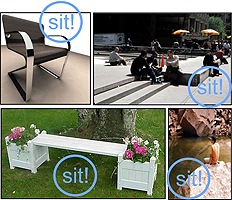 An affordance, a concept from Ecological Psychology, denotes a specific relationship between an animal and its environment. 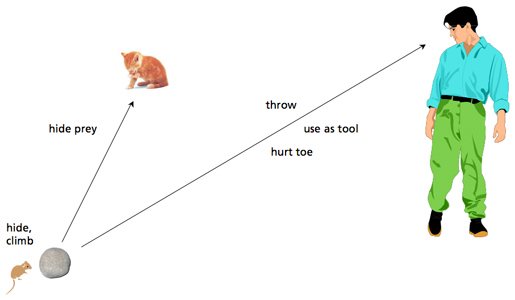 Perceiving an affordance means perceiving an interaction possibility that is specific for the animal's perception and action capabilities (Fig. 1). The MACS project investigated how this concept can be exploited to improve a technical system, a mobile robot with manipulation capabilities. The perception capabilities of mobile robots comprise detection and recognition algorithms that work on sensory data. The richest data are usually provided by camera images, and most employed algorithms stem from the field of Computer Vision. Appearance-based object recognition is a widely employed method for robot perception. But given that reliable recognition of everyday things is currently restricted to low numbers of objects, such methods seem too restrictive for reliable robot performance in everyday environments, particularly when mobile manipulation is involved. But what are the alternatives? Starting from the consideration that it is most important that a robot will get its job done, it is clear that a robot would benefit from abilities to find alternative solutions to a given task. The role model is the human ability to improvise, e.g. to use artefacts in ways that they were not designed for or to use one object instead of another one, provided they offer similar functionalities. A human could easily decide to use a mug as a drinking vessel if a glass is not available. Glasses and mugs have quite different appearances. But what is important in this example is their function as a drinking vessel, not the particular appearance. Fig. 2 shows another example, namely opportunities for a human to sit. Transferred to a technical system, perceiving an affordance does not include appearance-based object recognition, but rather feature-based perception of (object) functions. The central hypothesis of MACS was that an affordance-inspired control architecture enables a robot to perceive more interaction possibilities than a traditional architecture that relies on appearance-based object recognition alone. This project web site offers you the results of the MACS project, including the list of project publications and public deliverables, a link to an extensive online bibliography on affordance-related research, videos from the experiments, a list of events that we organized or attended, and more. Fig. 1: The same object, here a fist-sized stone, offers different affordances to different animals. For an adult healthy human, it offers the affordance of throwing it, or to use it as a tool, to name just two. For a mouse, it offers the affordances to hide behind it or to climb on top of it, and for a cat it offers the affordance of hiding prey. Fig. 2: Things that afford to sit upon for a human being. The MACS project was partly funded by the European Commission's Sixth Framework Programme. This support is gratefully acknowledged.